When it comes to closets, I have both good news and bad news for this week’s post. 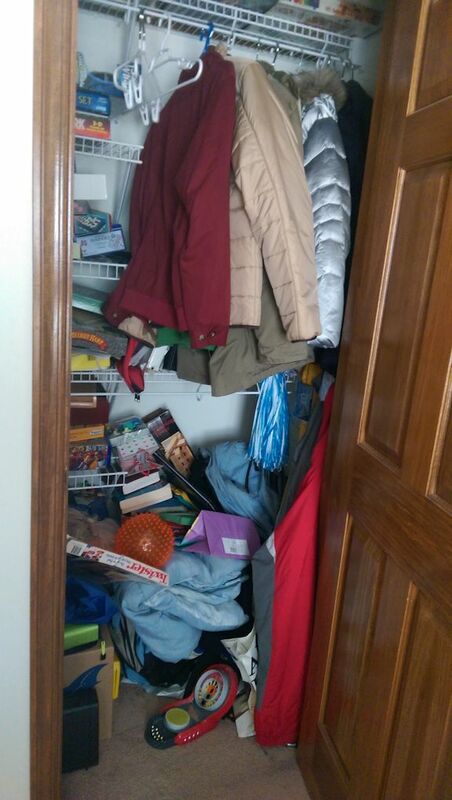 The good news is that the extra room in the basement where my daughter put her stuff when she graduated from college last spring is now at least semi-tidy. 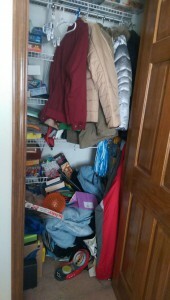 There’s no more stuff obstructing the doors to the closet, and its contents have been mostly tamed. The bad news, however, is that there is another whole closet full of clutter in the upstairs room that was originally the kids’ study. When we moved into this house, the closet was for board games and school backpacks and project materials, and it was kept at least somewhat organized for the first few years. Then it devolved into a colossal mess. That light blue cloth thing toward the bottom of the heap? It’s a bedspread that came with some sheets I already took out of the basement closet and donated to the thrift store a few weeks ago, not realizing that we still had part of the set upstairs. I have plans to turn this room into a sitting area—it faces southeast and is especially nice on sunny summer mornings. I want to replace the old brown carpet with a better-quality green, dispose of an old desk and put a nice new couch where it was, get a suitable end table to put next to the couch for teacups, buy a smaller glass desk to put on the other side of the room, paint the walls, and buy new artwork to hang on the walls. Then it will be a lovely place to sit and write blog posts and stories. But, first things first: Out with the clutter! Hi Meg! I love your clutter comedy posts 🙂 Here’s one for you: my mom texted me this morning that she got rid of over 1000 CD’s that my brother had burned in his high school and college days (we are both now long gone from the house and in our 30s). She has been trying to get him to clean out his old room at holidays and visits for the past 10 or so years. She is finally taking it on! Man, clutter is crazy (and comical :))! Thanks Annie — wow, your brother had quite a collection! Good for your mom, getting rid of the CDs after your brother left them in the house for so long. I need to do the same with my daughter’s old books, some of which are in boxes at the bottom of that heap in the closet, while others are in multiple rows on a bookshelf across the room. When she moves out, those books are all either going with her or being donated somewhere!